Homegrown Market OPEN for Saturday! NEW Local Greens Box! Homegrown Market OPEN for Saturday! Mango, Peaches and Cherries! Homegrown Market OPEN for Wednesday! Honey is back! Local honey from Webb’s is back! Homegrown Market OPEN for Saturday! New e-mail system. For those of you still wondering why there were not much in the way of lychee fruit in 2012, the basic rason was due to the unseasonably warm winter of that year. Warm winters are detrimental for lychee bloom induction and subsequent fruit set. A lychee is a rare sub tropical fruit originating in South China where the lychee is very important in their culture and is famed as “the King of Fruits”. The lychee fruit is about 1½ to 2 inches in size, oval to rounded heart shaped and the bumpy skin is red in color. Once you peel the skin off, the crisp juicy flesh of a lychee fruit is white or pinkish, translucent and glossy like the consistency of a grape, but the taste is sweeter. Lychees have a sub acid sweet taste and have a wonderful freshness to them that is hard to describe. Lychee fruit is high in the antioxidant Vitamin C and the essential mineral Potassium. We have seen some really great produce from Blumenberry Farms this season. They are located in Sarasota Farms and grow a variety of heirloom fruits and vegetables. Now available on the market are turnips. Thanks to everyone that braved the rain and came to our first food truck event this past Thursday! It was a blast and the food was delicious! Market OPEN for Saturday! Food Festival TOMORROW! Orlando, FL – (May 2nd, 2013) Homegrown Local Food Cooperative is excited to kick off the summer with fresh, locally sourced fare from Orlando’s finest food trucks. The Co-op is inviting foodies, vegetarians, gluten-free diners, or anyone who simply loves food trucks to support Central Florida’s farmers and artisan chefs and enjoy their conscious cuisine. The Homegrown Food Truck Festival will be held Thursday, May 2nd, from 6:00 – 9:00 PM. The coop will provide guests a fun, backyard cookout atmosphere, with live music and plenty of seating. Curbside Chef, combining a wealth of Global culinary influence and locally grown produce and herbs into a dazzling menu with Vegetarian, Gluten-free, nut and egg free options. Soup to Nuts, recently burst onto Orlando’s food truck scene, offers soups and grilled sandwiches that can be ordered gluten or dairy-free options. Local Yolk’l, proud supporters of the city’s local economy. They source cage-free eggs from Lake Meadow Naturals and always use fresh bread and bagels from local bakeries. Tom Scala, a long-time member of Homegrown Local Food Cooperative, and popular vendor at Audubon Park community market. His smoothies and freshly-squeezed juices are made using only local and organic produce. All From Scratch Baked Goods, made with love by Kellie Mitchell, apprentice to Chef Silvia of The Travelling Gourmet. Every treat is baked with the best organic, and all-natural ingredients in Orlando. All From Scratch offers brownies, cookies, vegan cupcakes and more. 301 E Princeton St Orlando, FL 32804. Please visit www.facebook.com/homegrownlocalfoodcoop for more details. Homegrown Market OPEN for Wednesday! 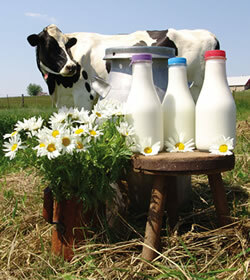 Organic Milk now available!